We all know where Chick-fil-A stands on gay marriage. But what about that other chicken fast food joint? 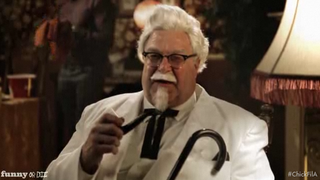 Don't worry, folks, the Colonel's here to make his stance known. With the help of some fabulous friends. Also, regardless of your stance on gay marriage (although seriously yay gay marriage! ), can't we all just agree on John Goodman? The rest of this week's top comedy videos, including a Girls parody with boys, a dead cowboy, and a crazy lady can all be found over at Splitsider. -We talked to Anthony Jeselnik about his upcoming Comedy Central show, standup, and quitting his writing gig at Late Night with Jimmy Fallon. -We looked at the Lost Roles of Will Ferrell. -We went to Montreal for the Just For Laughs festival and related some of the highlights. Patton Oswalt delivered an excellent keynote address. -We found Arnold's goofy side in Total Recall. -Bill Murray really, really isn't going to be in Ghostbusters 3. -Community's Dan Harmon is working on a pilot for CBS. -We looked at a talk with Ricky Gervais about his career before he was an international superstar. -We checked out Jerry Seinfeld's Comedians in Cars Getting Coffee. -We watched I Ain't Scared of You: A Tribute to Bernie Mac.